Todays post is on a very diffrent product for me, spray foundation! Its something I've wanted to try forever so I figured I would try it out with you all, and let you know what I think about it. Getting that gorgeous, airbrushed look has never been easier! 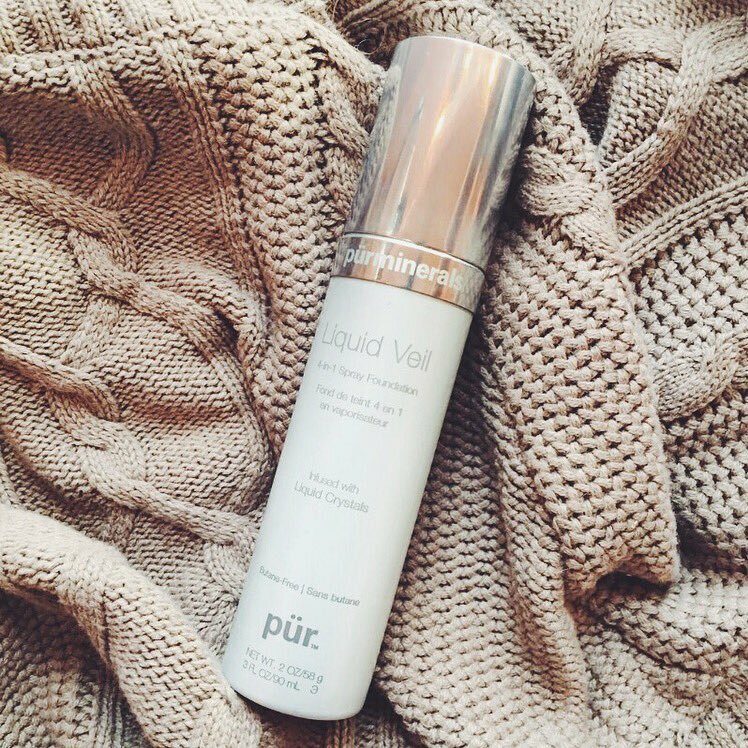 Liquid Veil 4-in-1 Spray Foundation delivers ultra-light, skin-perfecting coverage in a one-of-a-kind formula that’s years in the making. 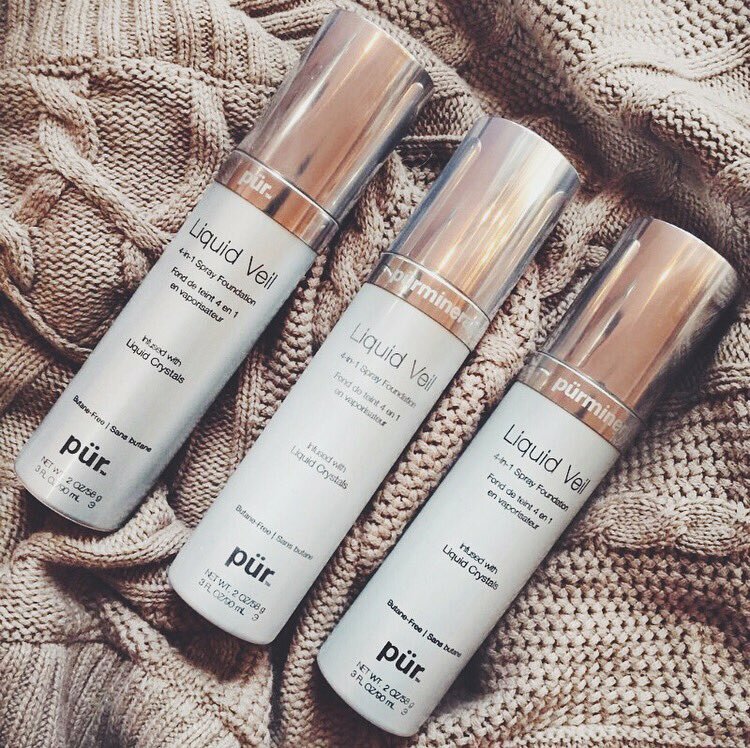 This non-butane spray-on liquid foundation, hydrator and skin-perfecting veil features two age-defying super-ingredients: Liquid Crystals, which retain moisture and reflect light for a dewy soft finish, and PÜR’s proprietary Ceretin® Complex for a satiny smooth, close-up worthy complexion you'll adore! So...spray foundation. Its a very odd concept and super different when trying it for the first time. Now I think that most people assume that spray foundation can just be sprayed all over your face like a hair spray and you'll be good to go. However, that's not really the case. 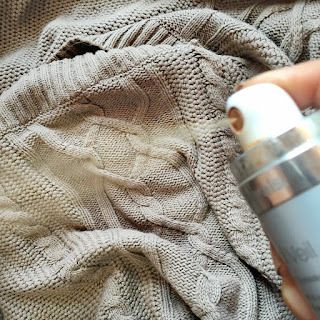 Unless you want foundation all over your clothes and in your hair ( I'm guessing you don't lol ) So let me tell you how to use it, in the best and easiest way possible. First off this product is a light / medium coverage, so you want to avoid a beauty blender with this one. A beauty blender and or any kind of damp beauty sponge, will naturally thin out your foundation and since this is a very light converge your not going to want that. First spray it on in small sections of the face. If you spray your entire face at once, you will probably get foundation all over your hair... Then use a large dense foundation brush ( I linked my fav pick for this below ) and push the product into the skin. If you buff you'll remove product, so try using a patting motion instead. This helps the foundation reach its maximum potential. Shades available online - light ; medium ; tan ; dark. Luckily with spray foundations there really isn't ever any kind of crazy colors to choose from. Its pretty straight forward with light, medium, and dark shades. 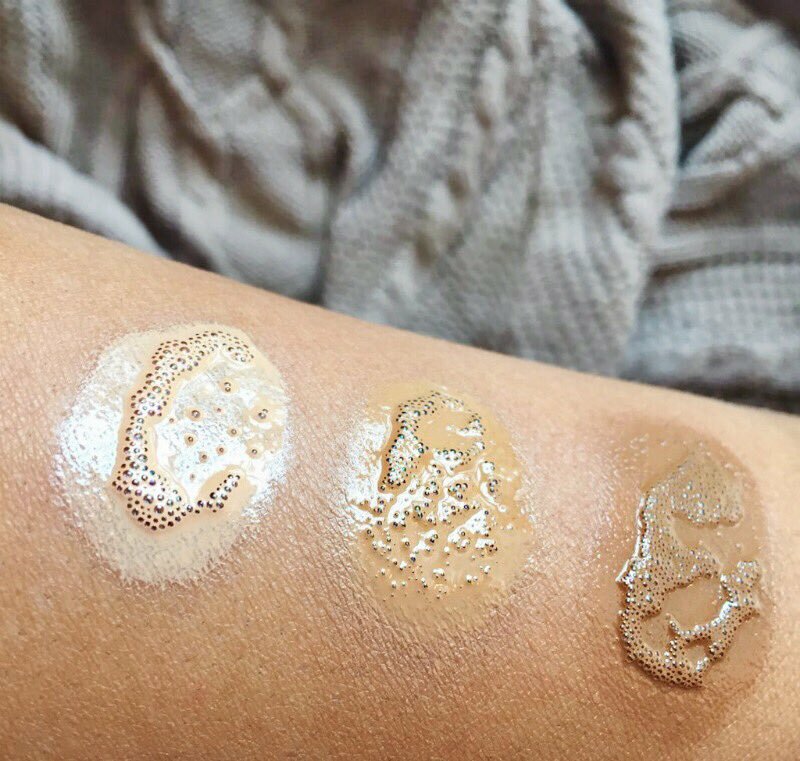 For me personally, I use the shade tan.. but could definitely see myself using dark in the summer time (As you can see above its not that much darker then my skin now) If you are more pale, I think the light color can really match a lot of skin tones. The finish of this product is something I really wanted to talk about. This specific product is meant to hydrate. ( hence the reason it has liquid crystals in it ) With this being said note that if you have oily skin, this is probably not the foundation for you. I personally have dry / normal skin so this foundation can work well for me, but even me having dryer skin I can still feel how hydrating / dewy it feels on the face. I always set my foundation with a light setting powder, I definitely recommend that with this foundation you do to. 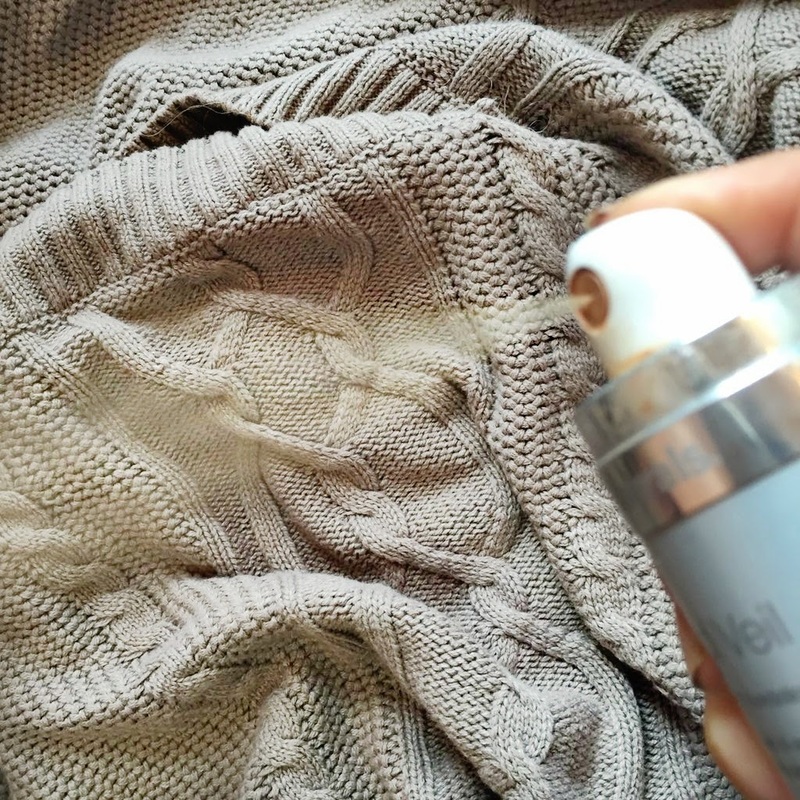 But if you like a dewy foundation, then you will love this one - I am super excited to use it for summer time, I have no doubt that it will be a go to.